This is actually a recipe without a recipe. You can play with the proportions as you like. You can macerate the apricots for around 2 hours beforehand in a couple of tablespoons of Amaretto or simply serve them fresh. 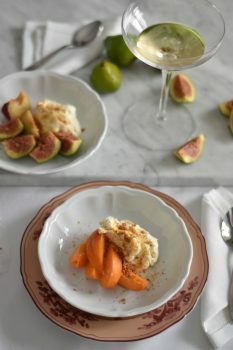 Instead of apricots you can use fresh figs or ripe peaches. Whip the mascarpone with sugar. Start by adding 3 tablespoons and taste. That level of sweetness might be already enough for you. The dessert should not be overly sweet, plus Amaretto liqueur and biscuits are already quite sugery. Share the mascarpone between four serving dishes, arrange the fruit pieces around the mascarpone. Sprinkle everything with the grated almonds and biscuits. Pour the Amaretto liqueur on top and it is ready to serve.